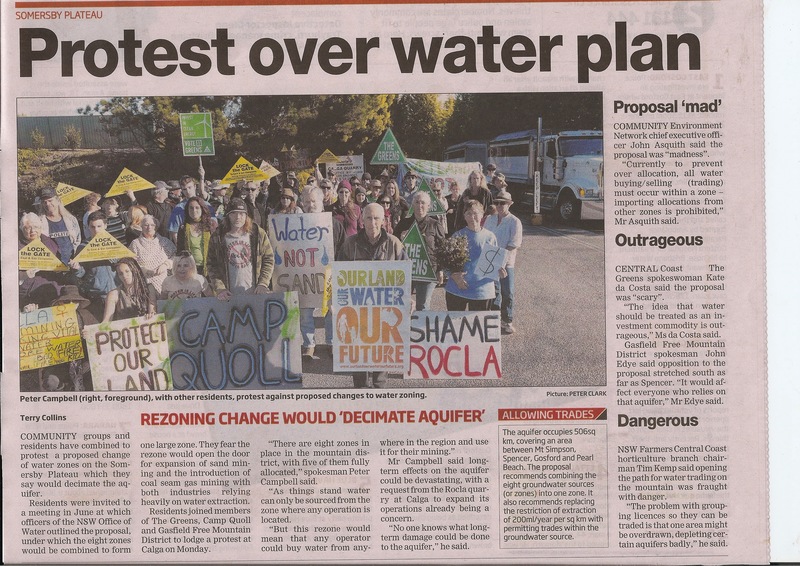 Coal Seam Gas committee members John Edye, Simon Perry, Elaine Slade, Marilyn Steiner and Sue Ellison joined The Green’s Kate de Costa and other community groups to call for the scrapping of proposed new water allocation rules, outside the gates of the controversial ROCLA sand mine last Monday. While the CSG subcommittee is totally focused on the threats coal seam gas mining bring to the district the issue of water extraction and the subsequent destruction of the aquifer is one we share in common with other community groups, including Our Land Our Water Our Future, Camp Quoll, The Greens, and other groups concerned with the impact of extractive and waste disposal industries on the mountain. The proposed, draft water allocation rules are a green light to such industries to accelerate their destruction of our land and livelihoods. Correction history: This entry was updated July 17th to reflect the fact that the changed allocation rules are in draft stage at present. The original version erroneously stated that the new allocation rules were already in place. Further updates will be ma de available once correct details concerning water allocation rules can be verified.